Special Olympics Rhode Island is proud to announce that Sgt. 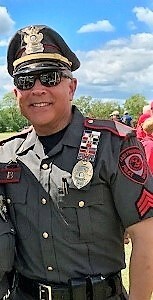 Diogo R. Mello of the East Providence Police Department and member of IBPO Local 569 has been selected to serve as part of the Final Leg team, serving as a Guardian of the Flame® as he runs the “Flame of Hope” throughout the United Arab Emirates (UAE) in March, leading up to the start of the 2019 Special Olympics World Games in Abu Dhabi, UAE. Final Leg runners from around the world were selected to proudly represent their local Torch Run and Special Olympics Programs. The Final Leg team will embark on different routes, running the Flame of Hope throughout cities and communities across the United Arab Emirates at various events, honoring the spirit of the Special Olympics global movement and delivering a message of hope to communities where people with intellectual disabilities continue to fight for acceptance and inclusion. The Final Leg Team will safely deliver the “Flame of Hope” to the 2019 Special Olympics World Games Abu Dhabi Opening Ceremony on 14th March. Sgt. Mello has been a volunteer with Special Olympics for over 10 years. From 2016 – 2018, Sgt. Mello was a member of the Torch Run Super Plunge Team https://vimeo.com/207340691. This team consisted of a small group of dedicated individuals who plunged into the frigid waters of Galilee; every hour on the hour for 24 hours. As a member of the Super Plunge Team, Sgt. Mello raised over $30,000 for SORI. This year Sgt. Mello will be one of 96 law enforcement officers selected from around the world, that make up the Final Leg Team. Sgt. Mello and his teammates will run the Flame of Hope throughout Ajman, Dubai, Sharjah, and Abu Dhabi. After days of running in 90-degree temperatures, what better way to cool down than to take a plunge into a pool filled with ice!!! That’s right, Sgt. Mello has committed to a unique fundraising event for Special Olympics, called the Abu Dhabi Dip! Sgt. Mello is asking that you consider making a donation in support of this event and Special Olympics http://igfn.us/vf/SOLAR/DiogoMello. The Opening Ceremony on March 14 is expected to attract 45,000 spectators while being viewed by millions worldwide via global broadcast partners ESPN and Abu Dhabi Media. The Law Enforcement Torch Run Final Leg for the 2019 World Games will take place from 3 March – 14 March. A team of 112 members – which includes 96 law enforcement officer runners, 10 Special Olympics athletes, and logistics personnel – will serve as Guardians of the Flame as they run the Flame of Hope throughout the UAE. The Final Leg and community visits will raise excitement for the World Games throughout the country. “For more than 38 years, the Law Enforcement Torch Run has been an integral part of the Special Olympics Movement,” said Khalfan Al Mazrouei, Managing Director of the 2019 Special Olympics World Games. “We look forward to cheering on the Final Leg Team as they bring the World Games message of inclusion throughout the country."